خطأ لوا في وحدة:Location_map على السطر 485: Unable to find the specified location map definition: "Module:Location map/data/Nepal" does not exist. كاثماندو (بالنيبالية: काठमाडौं }, pronounced: [kɑːʈʰ.mɑːɳ.ɖuː]; قالب:Lang-new) هي عاصمة نيپال وأكبر مدنها تقع في وادي يحمل نفس الاسم في وسط البلاد بالقرب من نهر بشنوماتي. تقع كتماندو على خط '43°27 شمالاً و '85°22 شرقًا (27.71667,85.36667). يبلغ عدد سكانها 670,000 نسمة. لايعرف المؤرخون متى أُنشئت كاتماندو، ولكن المنطقة قد سُكِنت منذ ما لا يقل عن 2,600 سنة. في عام 1768م، غزت مملكة جورخا المجاورة كاتماندو، ووحدت الإقليم الذي صار فيما بعد مملكة نيبال الحديثة. يعيش في كاتماندو اليوم خليط من مجموعات عرقية مختلفة. وأغلب سكان المدينة من الهندوس، ولكن هناك الكثير من البوذيين. 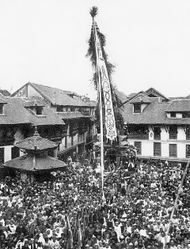 Left:Chariot procession or Jatra of Janabahadya in Kathmandu in the late 19th century. 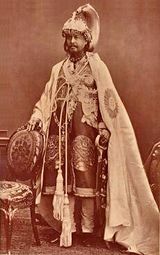 Right:Prime Minister Jang Bahadur in 1877. 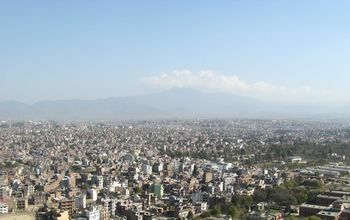 Left:Kathmandu. 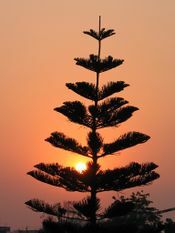 Right: Sunrise in Kathmandu. 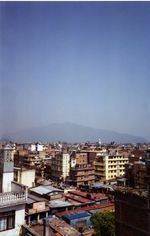 Islam is practised in Kathmandu but Muslims are a minority, accounting for about 4.2% of the population of Nepal. In 2004, the largest mosque in Kathmandu, Jama Masjid Mosque, was set ablaze by some 4000 people, and pulled furniture and electrical equipment out of the mosque and torched them on the sidewalk. It was a response to the killing of 12 Nepalese jobseekers in Iraq. The mosque was burned and more than a dozen private employment agencies vandalised who the protesters blamed for the loss of Nepalese citizens in the Iraq war. ^ "Census Nepal 2001". Retrieved 13 July 2007. 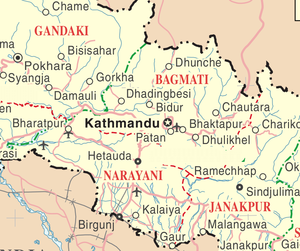 ^ "World Weather Information Service - Kathmandu". UN. Retrieved 2010-05-01. ^ "Nepal in Figures 2006" (PDF). Government of Nepal. Retrieved 2009-12-18. ^ "Kathmandu mosque ablaze after hostage killings". The Sydney Morning Herald. 2004-09-01. Retrieved 2009-12-18. Jha, Makhan (1995). 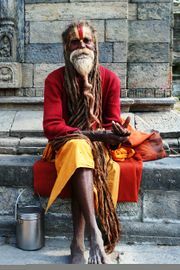 The sacred complex of Kathmandu, Nepal: religion of the Himalayan kingdom. = Gyan Books. p. 208. ISBN 8121204909. 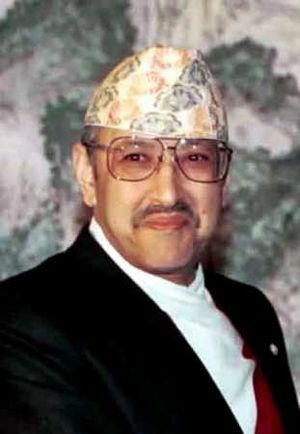 Kumar, Dhruba (2000). Domestic Conflict and Crisis of Governability in Nepal. 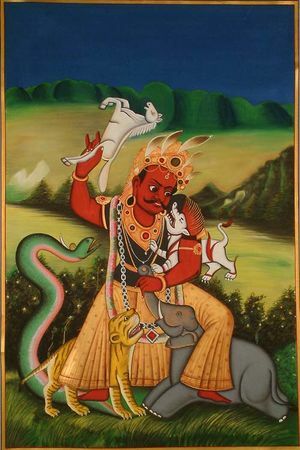 Mahakali Impasse. Kathmandu: Center for Nepal and Asian Studies. p. 324. ISBN 99933 52-05-5. Lonely Planet. Lonely Planet. 2006. p. 416. ISBN 1740596994. Nepal. Lonely Planet. 2006. p. 166. ISBN 1740596994. Shaha, Rishikesh (1992). Ancient and Medieval Nepal. Manohar Publications, New Delhi. ISBN 81-85425-69-8. Snellgrove, David (1987). Indo-Tibetan Buddhism: Indian Buddhists & Their Tibetan Successors. Two Volumes. Shambhala Publications, Boston. ISBN 0-87773-311-2 (v. 1); ISBN 0-87773-379-1 (v. 2). Watters, Thomas. (1904-5). On Yuan Chwang’s Travels in India. (A.D. 629-645). Royal Asiatic Society. Second Indian Edition. Munshhiram Manoharlal Publishers, New Delhi. (1973). 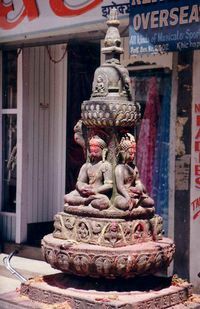 A Kushan-period Sculpture from the reign of Jaya Varma-, A.D. 184/185 Kathmandu, Nepal.